Commercial Window Washing | Bellerose, NY - West Cleaning Inc.
Start your day with the cleanest windows around. We customize our service to meet your exact specifications, so you get the results you want every time. Contact our team for complete glass treatment at competitive prices. Maintain your building's professional look with our cleaning service. One of the first things people notice are your windows, so you need a cleaning service backed by decades of experience. 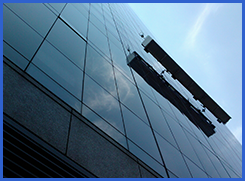 Since 1989, West Cleaning Inc. has provided exceptional commercial window washing throughout the New York City and Long Island area. We offer personalized service with three generations of industry experience. Our personnel are fully trained and equipped with the latest tools and safety gear. We always stay on top of all requirements and regulations, so we can continue to provide exceptional service. Our company is a member of the Building Trades Association that has an A+ rating with the Better Business Bureau and holds a rigger license issued by the NYC Department of Buildings. We take pride in our work and offer service for all types of windows and glass structures. Our team is still a family business that works with the client to promptly address all issues and concerns. Your satisfaction is always our top priority. We want to provide the very best service possible.